Japan’s media has been slow to report the number of children dying from judo class. Practitioners of judo in its purest form seek not only to attain physical strength, but also cultivate wisdom and virtue. Indeed, Jigoro Kano (1860-1936), the ‘father of judo’ moulded the discipline on the fundamental truths of the ‘Way’ — the basis of human and social life. But a recent report in the Japan Times points to a martial art that could well have lost its way, with some instructors paying scant regard to virtue, and even less to human life. The article describes brutal attacks by teachers on students that left children seriously injured, or even dead. 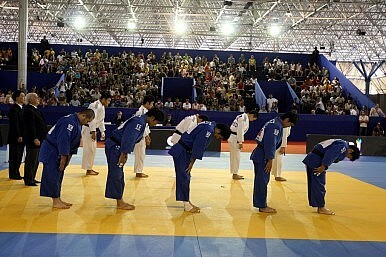 According to a doctor quoted in the story, an average of four children die every year as a result of accidents in judo classes at Japanese schools, 65 percent of them stemming from brain injuries. Parents have also reportedly pressed charges against the alleged perpetrators (many of them teachers who have taken discipline a step too far), but public prosecutors are said to have defenestrated their cases. While the Japanese-language press has reported on isolated incidents, they’ve failed to make the public at large aware of this worrying trend (reporters from mainstream media organisations reportedly have visited members of a victims’ group, but haven’t printed their plight in the vernacular dailies). To compound matters, the Japanese government will require all middle school students (aged 12 to 15) to study a martial art from the 2012 academic year, with schools being able to select between sumo, kendo or judo. If these classes are properly supervised and stringent safety precautions taken (which no doubt they will be at most schools), the positive mental and physical effects of martial arts training can only be applauded. But if school instructors lose control of their tempers or their classes, we could be looking at even starker statistics unless the judo establishment takes steps to put its dojo in order. Judo has been in the headlines for other reasons recently. Anton Geesink, a towering Dutchman who stunned the Japanese public by winning the first ever Olympic gold in the open weight division at the 1964 Tokyo Games, died aged 74 last week. Pint-sized Olympic champion-turned-lawmaker Ryoko Tani has been leading the cheers for political brawler Ichiro Ozawa’s bid to become prime minister. All this comes ahead of the world championships being held in Tokyo next week. With the sumo world struggling to grapple with a series of scandals involving illegal betting, gangsters, drunken brawls and marijuana (not to mention the death of a young wrestler in training), it’s about time that judo faced up to a dangerous reality. The nation’s 12-year-olds would certainly be grateful. More than just a great workout, martial arts often reveal much about a country’s history, culture, and traditions.